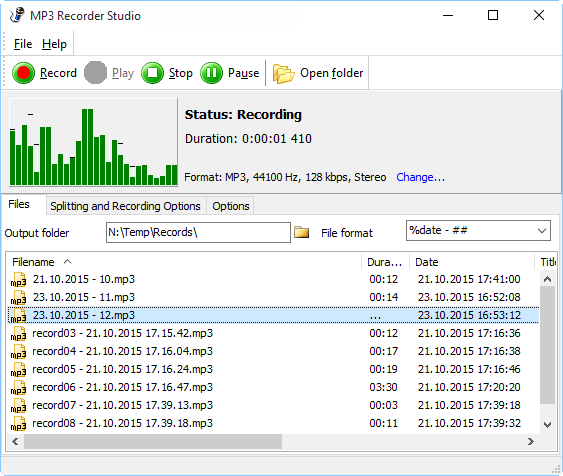 A new version of MP3 Recorder Studio has been released. As usual, this smart general-purpose audio recorder will help you record your voice, sounds and music produced by your computer, record any audio coming into the "Line in" socket of your sound card, etc. Thanks to its silence detection feature and the ability to save sound directly in the MP3 format the program can be used for long-time recordings. In the latest version, the sound recorder's code was revised to improve compatibility with Windows 10. The program fully supports Unicode and works on all editions of Windows 10, Windows 8.1, Windows 8, Windows 7, Windows Vista, Windows XP. 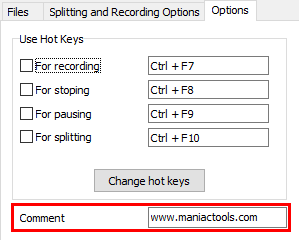 Filename patterns have become more flexible in MP3 Recorder Studio 9.0. Now, among other things, you can include date and time. The "File format" menu offers several pre-defined filename patterns, using the %date and %datetime variables. Just select one of the ready-made formats or enter your own one. Additionally, the new version allows to enter basic ID3 tags: title, artist, year, comment, etc. The fields can be edited directly in the list of records, on the "Files" tab. In previous versions, the spectrum analyzer worked only in the recording mode. MP3 Recorder Studio 9.0 uses it also when playing recorded files. The "Files" list now offers a right-click menu. Here you can choose to delete the selected record or show it in Windows Explorer. The latter option may be helpful if you need to transfer the recorded audio to some portable device / phone or send it via email. There are some further improvements in MP3 Recorder Studio 9.0. The program is now part of Media Pack, so if you already have a Media Pack license, you can simply download and use the latest version of MP3 Recorder Studio without any limitations. Enjoy recording sound on your computer with MP3 Recorder Studio!